The Aggies Athletic Department has a Twitter account at www.twitter.com/nmstateaggies where fans and media can get all their in-game scores. 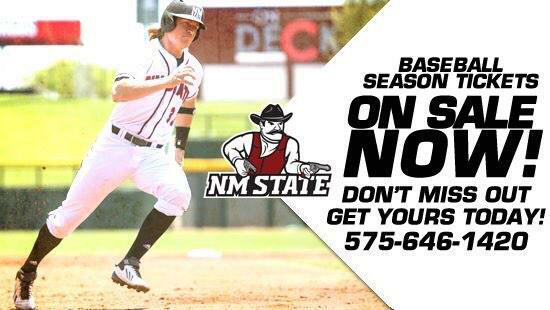 The Aggies also have a Facebook page at www.facebook.com/NMSUathletics. Don’t forget to follow us on Instagram at nmstateaggies for all the behind the scene info on your team. The New Mexico State flagship radio station for football and men’s basketball is changing from 103.9 FM to 98.7 FM in Las Cruces. All football and men’s basketball games will be aired live and in their entirety. This move took effect for the first home football game on Thursday, Au- gust 28 at 6 p.m. (MT). The Aggies fell at home to UL Monroe 30-17, Nov. 22. The loss was the Aggies ninth straight, moving them to 2-9 overall and 1-6 in Sun Belt Conference play. While the game was close at halftime, 20-17 ULM, the Warhawks managed to make some halftime adjustments that shut the Aggies out in the second half. Larry Rose had a record setting night, rushing 35 times for 229 yards and two touchdowns. He is now No. 5 all time for single game rushing attempts and No. 7 all time for single game rushing yards. The Aggies will look to take on Arkansas State, Nov. 29 on the road in Jonesboro, AR. The Aggies are 6-2 against the Red Wolves in the series history. The two teams first met on Sept. 11, 1993, where the Aggies went on the road to beat the Red Wolves 22-19. The last meeting between the two teams took place on Nov. 15, 2003 in another close game where the Aggies lost 28-24. Arkansas State is currently 4-3 in the SBC and 6-5 overall. Arkansas State was founded in Jonesboro, Ark. In 1909 and is a public university and is the flagship campus of the Arkansas State University System; the state’s second largest college system and university by enrollment. Head coach Blake Anderson is a 13-year coaching veteran at the NCAA FBS level who also coached in an NJCAA National Championship game. Anderson was named the Red Wolves’ 30th all-time head football coach on Dec. 13, 2013. Wide receiver J.D. McKissic was named to the Sports Illustrated’s All-America Team as an honorable mention selection in 2013 and senior linebacker Qushaun Lee was a first team all-Sun Belt Conference Selection in 2013.